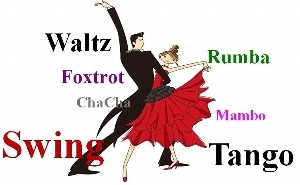 Join us for a great evening of Ballroom, Latin, Swing, Hustle and Night Club dancing. Dance the night away to some wonderful holiday music. Cost: $12.00/per person - sorry, no credit cards accepted. There is No Membership or reservations required. Simply show up and enjoy the evening. Singles and Couples are welcome to attend. Admission - $12 per person (cash or check) - pay on arrival. Come on out and join us for a Festive evening of dancing, socializing and great holiday music!